Our journey through CHA has come to an end. By mid-day today we had seen all that we were interested in and came away with some fabulous ideas. 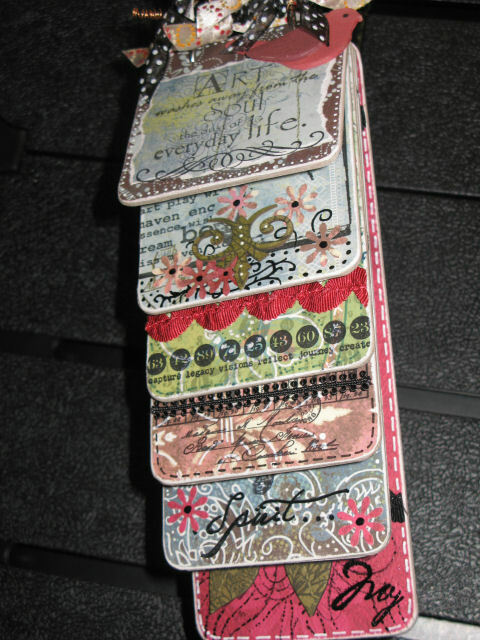 Some of the most exiting new products I was most taken with were from Ranger and/or Tim Holtz. Not only does Ranger have the new line of pigment inks coming out there is also the new White Opaque pen. 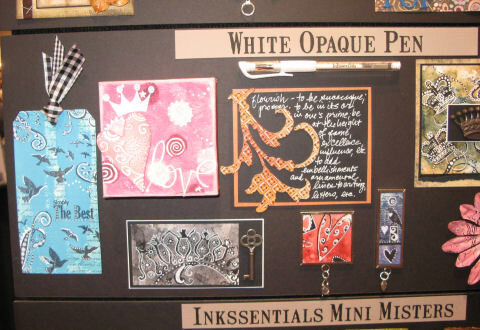 I was able to get a photo of the white opaque pen sample board. 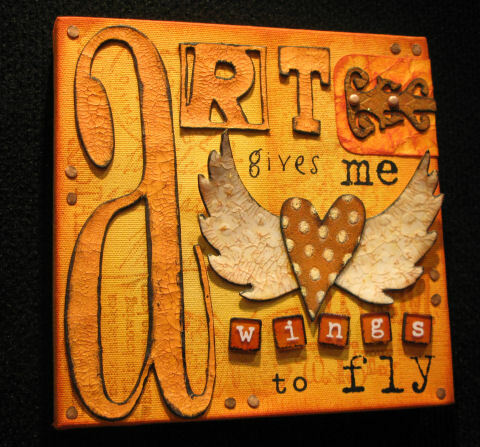 Also at the Ranger booth I found some altered canvases using Grunge Board and the Crackle Paint. I’ve been working on something similar for the last few weeks and now can’t wait to get home to try some of the new things that I saw. 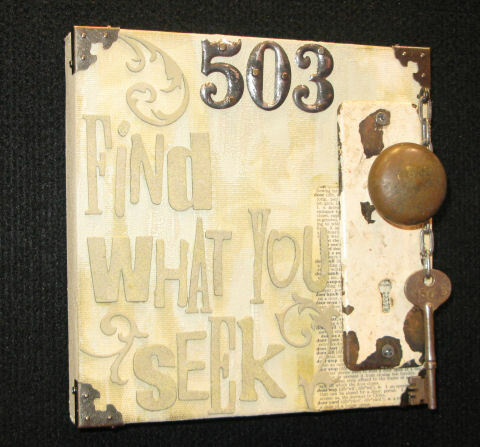 Tim Holtz is coming out with some smaller Grunge Board that will be excellent for card makers. The pieces are the same elements that are now out, only a smaller version. 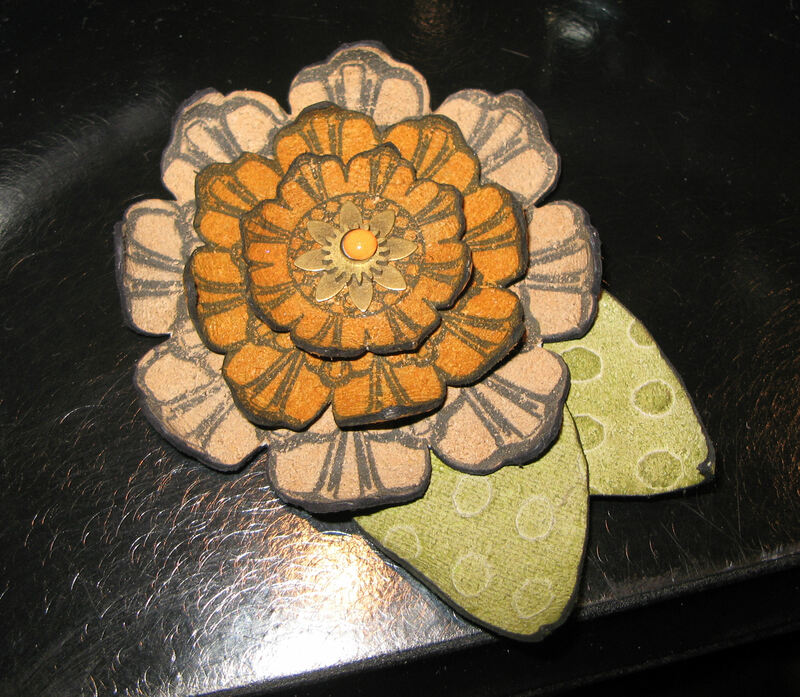 One thing I did see at the Tim Holtz Idea-ology booth was a Grunge Board flower. One of our stops was the Maya Road booth. 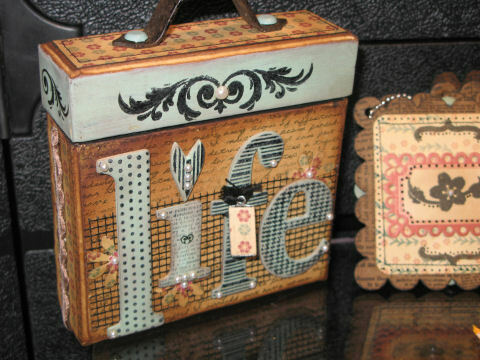 Some of the new books and little key chain pieces are just fabulous. Kittie leaves us tomorrow morning, and Jeanne and I head on into the valley for a few days. 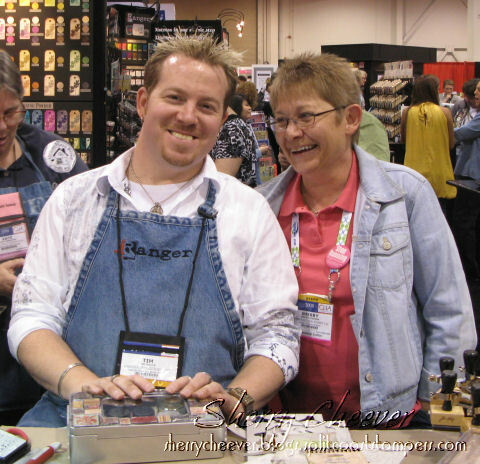 Both Jeanne and I will be working the Rubbernecker booth this coming weekend at the Heirloom’s San Mateo Rubber Stamps & Paper Arts Festival. Monday was such a great day! Productive and fun!! The first place we headed was to the Ranger Booth to do the Make and Take. Ranger is coming out with a new line of pigment inks and a new white gel pen. 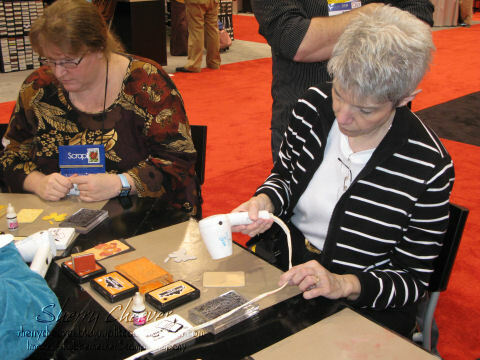 The Make and Take was using both products, along with some Maya Road chipboard, and we wanted to be some of the first in line. Jeanne, Pat and I were lucky enough to get a seat right away. Kittie had to wait a bit. It seemed like we were at the Ranger booth quite a while today. The ladies from Flourishes came by and we had to have a photo op. Then we ran into Sherrie Siemens and Alli Miles . . . Another photo op. As we were just hanging around, we took the opportunity to have a Rubbernecker Team picture made. 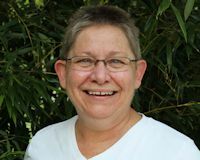 I had been hoping for day to get the opportunity to meet Julie Ebersole. Today was the day! 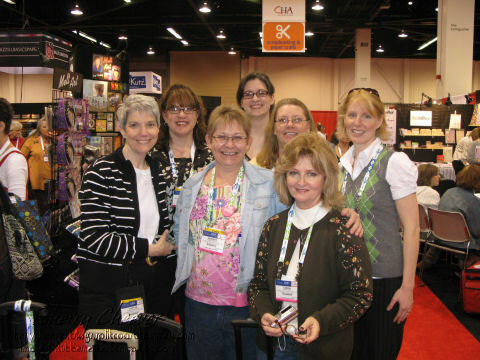 We finally found the A Muse Booth and Julie was there. I can’t even begin to imagine what was running through her mind when she turned around and all these Dirty Girls were standing there just smiling at her! How much fun!! Tonight was our Lizzie Anne Team Dinner and also the Dirty Dozen/Moderator dinner. 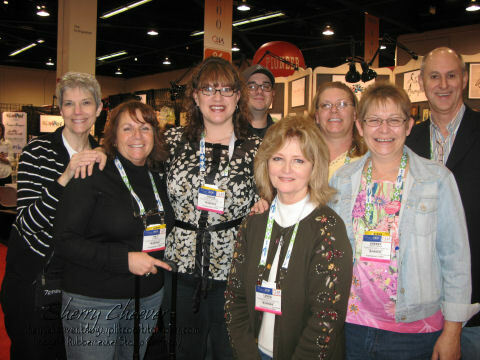 Needless to say, we couldn’t be at two places at one time and the Lizzie Anne Team won over. One more photo, Dave finally found some hair! It’s a little late, and this girl’s flabby flanny is a draggin’ . . . more tomorrow. Oh my Badness! I am so sorry. We have been so busy and I was so exhausted I crashed and burned. Jeanne said I was snoring before my head even hit the pillow and that was after five cups of coffee. We are having a wonderful time, albeit busy. Kitties and I met up in Phoenix to fly the last leg in together and we landed Saturday around 3:00 PST. We have been running since. 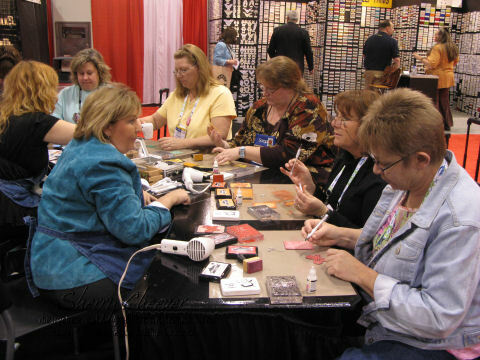 Saturday night after dinner we attended the Splitcoaststampers Reception. WOW is all I can say! I stood back at one point, looked around the room – there was sooooooooo much talent assembled in one place! Needless to say, I didn’t get my camera out, by Kittie’s did. She has posted some pictures of the Dirty Dozen, past and current, that were assembled that night – HOLY MOLY! 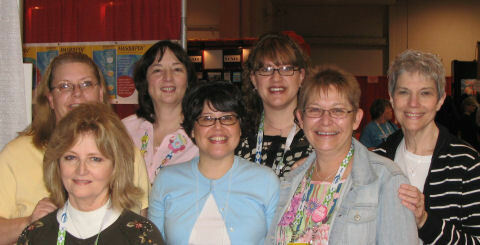 I can’t tell you how much fun I had meeting all these wonderful women who have so inspired me over the years! I can’t believe I finally got to meet Trudee! Love these girls!!!! Yesterday we started out early, arriving at CHA a little after 9:00. We walked and we walked till our feet hurt and we couldn’t walk no more! The total highlight of the day for me — Getting to meet Tim Holtz! 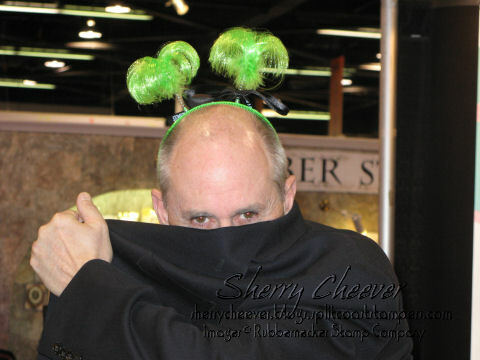 This picture was just about the time I leaned over and told him WHY they call me BadSherry. I also met the most fascinating designer yesterday. 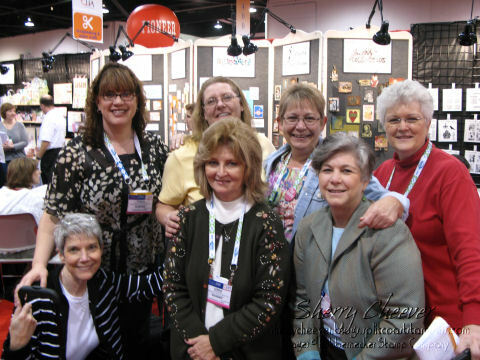 Judi Hodgkin who has a new line of paper with Product Performers, ScrapperDashery. This paper is matched to all the Adirondack inks, and is absolutely fabulous. I was able to get a picture of her with a mini book and a letter that she had made. 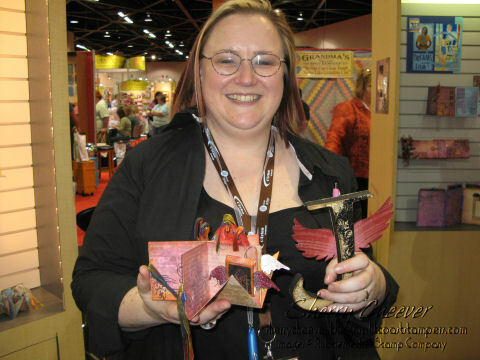 I so need to try and make one of these books. I hate to admit it, but we missed one of the gatherings we really wanted to attend on Sunday night. By the time we had finished dinner and headed back to our hotel, all we wanted was coffee and to get off our feet. Even though I’m writing this all at one time, I’m going to break it down into segments. There is so much going on here in the background that I can’t keep focus. I need to regroup and start all over.